Los Angeles - An pair of extraordinary letters by Gonzo journalist Hunter S. Thompson will be auctioned by Nate D. Sanders Auctions on April 25, 2019. 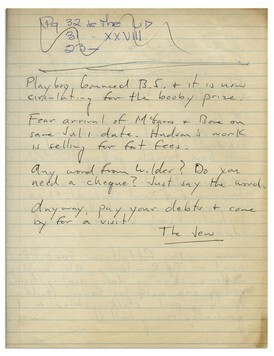 Thompson sent the letter being auctioned to his friend Paul Semonin in early June 1961 from Big Sur. Semonin was Thompson’s Louisville, Kentucky childhood friend. Bidding for the letter begins at $2,500. Bidding for the letter begins at $2,000. Mexican imprints proved to be popular with six earning top prices in the sale. Highlights included a first edition 1674 pamphlet by famed Mexican poetess Sor Juana Inés de la Cruz, consisting of Christmas carols to be sung in honor of the thirteenth-century St. Pedro Nolasco. It set a record for the author at $45,000. Juan Navarro’s 1604 Liber in quo quatuor passions Christi Domini continentur, the first music by a New World composer printed in the Americas, earned $32,500, and a first edition of Alonso de Molina’s 1565 full-length confessional manual with instructions on the administration of the sacraments, written in Nahuatl and Spanish, brought $21,250. Mexican manuscripts featured an extensive illustrated file detailing a land dispute between a ranch owner and his Nahua neighbors, with 350 manuscript pages ($30,000). 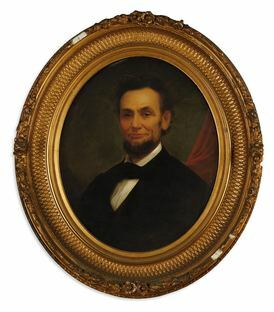 “The successful sale of the Holzer Lincolniana collection last fall brought in a strong group of related material for this auction, including our top lot, a beautiful portrait of Lincoln by Matthew Henry Wilson,” said Stattler-the artist’s copy of the last portrait rendered from life set a record for Wilson at $55,000. Other Lincoln and Civil War material of note included a newspaper extra from Detroit announcing Lincoln’s assassination, which topped its high estimate at $15,000, a likely record for any newspaper with that news, and Benson Lossing’s Pictorial History of the Civil War of the United States of America, 1866-68, ($15,000). Texas material was led by the manuscript diary of William Farrar Smith documenting the 1849 Whiting-Smith Expedition to form a trail from San Antonio to El Paso ($47,500) and a first edition of Batholomé Garcia’s Manual para Administrar los Santos Sacramentos, 1760, the only early work published in the Pakawan language ($13,000). Lots relating to the early days of America included the May 6, 1775 issue of the Virginia Gazette which reports first-hand accounts of the battles of Lexington and Concord, at $12,500, and a journal of contemporary manuscript notes dated 1788, from the Massachusetts convention to ratify the Federal Constitution, emphasizing the need for a Bill of Rights and for sovereignty of the states, at $16,250. Additional auction records included a rare corrected variant of the 1852 Liverpool Book of Mormon, which brought $41,600, a record for any European Mormon publication, as well as an 1850s whaling diary kept by captain’s wife Alida Taber, which earned the highest known price for a woman’s whaling dairy, at $15,000. The next auction from Swann Galleries’ Books & Manuscripts Department will be 19th & 20th Century Literature on May 14. Visit swanngalleries.com or download the Swann Galleries App for catalogues, bidding and inquires. Image: Lot 113: Matthew Henry Wilson, Abraham Lincoln, oil on canvas, an artist’s copy of the last portrait rendered from life, 1865. Sold for $55,000. 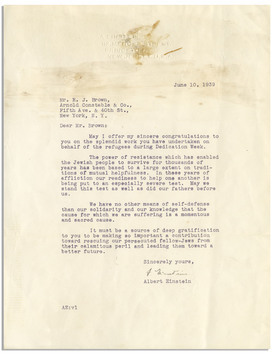 Los Angeles - A fascinating letter by Albert Einstein on the Jewish People’s rights to defend themselves will be auctioned by Nate D. Sanders Auctions on April 25, 2019. Einstein had long worked to save European Jews by issuing affidavits. Amherst, MA --The Eric Carle Museum of Picture Book Art celebrates the golden anniversary of William Steig's seminal book Sylvester and the Magic Pebble. Steig's famous fable tells of Sylvester Duncan, a donkey who discovers a magic pebble and accidentally turns himself into a rock. With humor and pathos, Steig illustrates an emotional tale of discovery, loss, and reunion. Above all, it is a story about the love of family. William Steig's Sylvester and the Magic Pebble: A Golden Anniversary is on view from May 4 to December 1 in The Carle's Central Gallery. Sylvester and the Magic Pebble has held a special place in readers' hearts for 50 years. Contemporary illustrators often cite the book as one of their greatest influences. The Carle is fortunate to have in its permanent collection Steig's preliminary sketches and dummy books related to the publication, thanks to the generosity of Jeanne Steig who donated over 1,000 art works by her late husband. The artist's daughter Maggie Steig has generously loaned the original published illustrations--along with her father's paints, tools, personal family photographs, and his prized Caldecott Medal--to the exhibition. "We have deep holdings of work by Steig in our collection," says chief curator Ellen Keiter. "It is an honor to care for his art and to share it with our guests, particularly during a special anniversary year." In addition to Sylvester and the Magic Pebble, The Carle holds Steig's art for 39 other titles, such as The Amazing Bone (1976), a Caldecott Honor book; Abel's Island (1976) and Doctor De Soto (1982), both Newbery Medal honor books; and Amos & Boris (1971), Dominic (1972), and Caleb & Kate (1977), all National Book Award honorees. Other favorites include CDB! (1968), Brave Irene (1986), and Shrek! (1990), an adaptation of which won an Oscar for best animated film of 2001. Steig had a prolific and acclaimed career in the arts. Hailed as the "King of Cartoons," he produced a staggering 1,600 drawings and over 100 covers for The New Yorker during his lifetime. At age 61, Steig embarked on a second career as a children's picture book author and illustrator. Sylvester and the Magic Pebble was the third of his 40 books for children. The Carle has featured Steig's art in numerous exhibitions, most recently in Treasures from the Collection: A 15 Year Celebration. 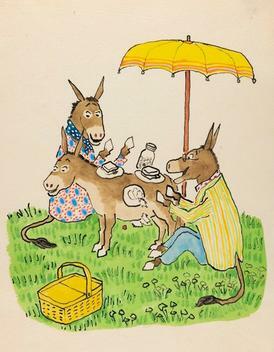 In 2004, the Museum organized the retrospective Heart and Humor: The Picture Book Art of William Steig. For this presentation, The Carle designed a charming tableau vivant of Steig's picnic scene--including a "Sylvester rock"--to engage visitors of all ages. Eric Carle and his wife, the late Barbara Carle, co-founded the Museum in November 2002. Carle is the renowned author and illustrator of more than 70 books, including the 1969 classic The Very Hungry Caterpillar. Since opening, the 43,000-square foot facility has served more than 750,000 visitors, including 50,000 schoolchildren. The Carle houses more than 11,000 objects, including 7,300 permanent collection illustrations. The Carle has three art galleries, an art studio, a theater, picture book and scholarly libraries, and educational programs for families, scholars, educators, and schoolchildren. Bobbie's Meadow is an outdoor space that combines art and nature. Educational offerings include professional training for educators around the country and Master's degree programs in children's literature with Simmons College. Museum hours are Tuesday through Friday 10 am to 4 pm, Saturday 10 am to 5 pm, and Sunday 12 pm to 5 pm. Open Mondays in July and August and during MA school vacation weeks. Admission is $9 for adults, $6 for children under 18, and $22.50 for a family of four. For further information and directions, call (413) 559-6300 or visit the Museum's website at www.carlemuseum.org. Image: William Steig, Preliminary illustration for Sylvester and the Magic Pebble (Simon & Schuster Books for Young Readers, 1969). Gift of Jeanne Steig. © William Steig. Philadelphia — On Wednesday, April 10, Freeman’s had the privilege of auctioning nearly 500 lots from the Collection of Ambassador & Mrs. Alexander Weddell, deaccessioned by the Virginia House Museum to benefit future preservation, acquisitions and care of collections. With an impressive 98% sell-through rate and unprecedented registration from online bidders, the single-owner sale nearly doubled its pre-sale high estimate, totaling $1.57 million. Though originally chosen to describe the diverse contents that were collected by the Weddells during their personal and professional foreign travels, the auction’s overarching title: Across Continents equally befits the strong international interest that the sale ultimately generated. After a comprehensive marketing campaign targeted to a global audience, both new and established bidders from around the world actively participated in the sale, vying to acquire the fresh-to-market furniture, decorative arts, paintings, textiles and books from this time-capsule collection. Members of the trade, private collectors, and institutions alike expressed serious interest in the collection, either with the intent of bidding or of furthering academic studies and contributing to existing scholarship. Top price was achieved just over eight hours into the marathon auction by Lot 406: A book of various types of Ottoman dress. Exciting a full bank of active phone and internet bidders, the rare book — containing 148 original watercolors by a follower of the artist Fenerci Mehmed — sold to a prominent private collector in the room for an impressive $137,500 (estimate: $4,000-6,000). 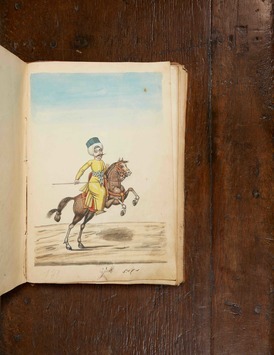 Costume albums by Mehmed are in the Istanbul University Library, the Topkapi Palace, and the Rahmi Koç Collection. This climactic moment crowned a series of strong prices achieved for Ottoman decorative arts, preceded by the back-to-back sales of Lots 155: A large pair of 17th/18th century Ottoman cast and turned brass candlesticks, which realized $25,000 (estimate: $1,000-2,000) and 156: An early 19th century Ottoman gilt-copper (tombak) ewer and basin that sold for $48,750 (estimate: $4,000-6,000). Decorative arts from the Far East also performed well, led by Lot 199: A finely cast and engraved Tibetan gilt copper alloy figure of a seated Buddha, 16th/17th century or earlier, that realized $42,500 (estimate: $8,000-12,000). In spite of a market that is all too frequently bemoaned, furniture from the Weddells’ collection performed remarkably well, with many lots exceeding their estimates. Lot 49: A Nasrid-style early marquetry and ivory inlaid cassone, Venice or Barcelona, late 15th century, skyrocketed past its pre-sale estimate of $6,000-8,000 to sell for $59,375. Bearing similarities to examples found in notable institutions such as the Rijksmuseum, Amsterdam and the Victoria & Albert Museum, London, this early and extraordinary chest elicited strong interest from national and overseas parties. Other furniture highlights included Lot 296: An impressive Spanish Renaissance carved walnut refectory table, 17th century, that sold for $37,500 (estimate: $5,000-7,000) and Lot 309: A fine Spanish Baroque iron-mounted and velvet-lined parcel-gilt walnut Vargueño on stand, 17th century, that realized $28,750 (estimate: $8,000-12,000). The arts of Colonial and Latin America emerged as a particular area of interest to collectors. Many of the lots the Weddells acquired during their time in Mexico City and Argentina with the help of Austrian art dealer Rene d’Harnoncourt, the former director of MoMA, sparked competitive and lengthy bidding wars. The pattern emerged early when Lot 40: A Spanish Colonial polychrome lacquer tray, second half 18th century, made over thirty-six times its estimate to sell for $11,050. This was succeeded by the lively sale of Lot 234: A Mexican biombo with emblems from Otto Van Veens Horattii Emblemata, 18th century, that brought $17,500 (estimate: $2,000-3,000) and Lot 242: A Mexican silver eight-light votive lamp in the Spanish Colonial style, bearing marks for Cayetano Buitrón, likely late 19th century, that achieved $17,500 (estimate: $2,000-3,000). Fine Art hailing from the region also fared well, with Lot 260: Cuzco School (18th century), The Death of the Virgin, selling for $26,250 (estimate: $12,000-18,000) and Lot 232: Mexican School (18th century), The Virgin of Ocotlán, realizing $15,000 (estimate: $3,000-5,000). The highest price for a work of art in the collection was achieved by Lot 253: Le Désenchanté (The Disillusioned), a root wood sculpture by Stephen Erzia (Russian 1876-1960), which sold for $71,500 (estimate: $15,000-25,000). The Weddells purchased the work directly from the artist, whom they met in Argentina in the 1930s. Alexander and Virginia purportedly purchased three other sculptures by Erzia, which they donated to the Virginia Museum of Fine Arts. Numerous lots from the sale will be finding new homes in institutions, both within the United States and abroad. Most notably, several objects - including Lot 79: A Flemish mythological or historical tapestry, mid to late 16th century - will be returning to their former neighborhood of Windsor Farms in Richmond, Virginia, having been acquired by Agecroft Hall and Gardens - the historic mansion directly adjacent to Virginia House. Additionally, Lot 78: Portrait of a Court Lady, Bust-Length by Franz Kessler (1580-1650) will be presented in a couple of months to the Wallraf-Richartz-Museum in Cologne, Germany, where the artist was born and spent most of his life. The consistently strong performance of this varied collection that spanned countries, centuries and collecting-genres is testimony to Freeman’s success with single-owner sales, to its commitment to the proper and careful handling of institutional de-accessions and to its truly international reach. “It was a great pleasure working with the Virginia Museum of History and Culture on this de-accession,” remarks Freeman’s Vice President and Southeast Representative Colin Clarke, “This collaboration and the opportunity to handle such rare, first-rate material has definitely been one of the highlights of my professional career. It resulted in a beautiful exhibition, an in-depth and scholarly catalogue, and an exciting sale with results that speak for themselves." Image: Lot 406: A book of various types of Ottoman dress containing 148 original watercolors by a follower of the artist Fenerci Mehmed, sold to a private collector for $137,500 (estimate: $4,000-6,000). Dallas, TX - Consignments from five private collections, including one of the most comprehensive private compilations of Robert E. Lee photographs (many of which are signed by Lee) ever assembled, will be among the highlights in Heritage Auctions’ Americana & Political Auction May 4-5 in Dallas, Texas. A diligent scholar of his subject, Dr. Hopkins authored the book Robert E. Lee in War and Peace, which is extensively illustrated with examples from this collection. · Robert E. Lee: Mammoth Mathew Brady Photograph is a double-matted and framed photo showing a full view of Lee seated next to a table topped with an elaborate clock. This is not the same pose as the commonly seen “clock portrait” because of the position of Lee’s elbow in relation to the clock on the table, and other details. 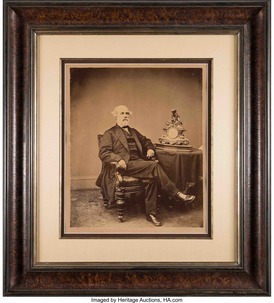 · Robert E. Lee: Full Standing "Blockade Portrait" Carte-de-Visite [CDV] by Vannerson & Jones is a post-war printing of the 1864 studio portrait by Vannerson, one of two taken for use by 19th-century artist E.V. Valentine as models for his sculpture. The offered image was printed from Vannerson’s original negative after he entered into a partnership with Jones. · Robert E. Lee: Unpublished, Boldly Signed Carte-de-Visite [CDV] is a vignette bust of Lee, taken during fall and/or winter of 1865-66 by Isaac N. White and Joseph Kelley, who took one outdoor view of Lee atop Traveller, Lee’s most famous horse during the American Civil War, and two indoor shots. It has a cancelled two-cent stamp on verso, and is inscribed “White & Kelley.” The offered CDV was kept by the Alexander family in Stuart’s Draft, Augusta County, Virginia from 1866-2013. It descended through the family and was found secured in the Alexander library inside a copy of General Lee: Great Commander Series by Fitzhugh Lee. Other diverse categories strongly represented in the auction include political and presidential collectibles, Old West artifacts, items from the early days of the Woman’s Suffrage movement, and antique advertising. A rare Punch Cigar Store Advertising Figure Cast in Zinc, Circa 1885. Fashioned in the form of one half of the Punch and Judy puppet show, the Punch figurine remains the most elusive for collectors, and rarely comes to the auction market in such exceptional condition. Depicting Punchinello, the Lord of Misrule, with cigars in his right hand, the figure has “Wm. Demuth & Co. Manufacturers New York” cast in the base. A notorious distributor of pipes and cigar store trade figures, Demuth entered into a partnership in 1863 with Brooklyn-based foundry operator Moritz Seelig, to produce cast metal trade figures to sell through Demuth’s catalog. Zachary Taylor: Only Known Example Campaign Banner for the 1848 Whig Candidate and 12th President is in the style of campaign banners that attained extreme popularity in the 1840 and 1844 political seasons, but many seemed to disappear during the following two presidential elections. They enjoyed a resurgence in 1856 and rode the new wave of popularity through the remainder of the 19th century. This is the only example that Heritage Auctions ever has seen, in private or public collections, making this one of the most important political flags ever to reach the auction market. The flag is emblazoned with “Brave Old Zach” on the front, and “He protected the children” on the back - almost certainly a reference to the first event which brought Taylor national attention - as an officer in his first battle in the War of 1812, he commanded Fort Harrison, which came under attack by Indians who were siding with the British. Taylor rallied the troops, fending off the attack while allowing no harm to the women and children. · William Barret Travis: Legal Document Signed "W B Travis"
Whitman worked as a schoolteacher, printer, newspaper editor, journalist, carpenter, freelance writer and civil servant, but he is best known as one of America’s most famous poets - and as a poet of democracy. The Library will collaborate with the National Council of Teachers of English to host a Transcribe-a-Thon webinar on April 24 at 4 p.m. Eastern time. The one-hour event will bring together experts from the Library, NCTE and educators to discuss how students can analyze, transcribe, review and tag the Whitman papers. Registration is open to all and available here. The display will retrace Whitman’s life, from his birthplace on Long Island, New York, his rise as an American poet, his life in Washington - including his intimate relationship with Peter Doyle, his care for Civil War soldiers and his admiration for Abraham Lincoln - his hands-on involvement with the design and publication of his poetry collection “Leaves of Grass” and pop culture references to Whitman and his legacy. It was “Leaves of Grass,” his break-through work of free verse celebrating democracy, sexuality, human potential, universalism and the natural world, that would earn Whitman worldwide fame. Thursday, May 23 at 7:30 p.m. at Packard Campus Theater, Culpeper, Virginia. Local historian Bud Hall will present a talk at the Library’s Packard Campus Theater in Culpeper about Whitman’s time in the area, followed by a screening of “Shenandoah” (Universal, 1965). Jimmy Stewart stars as a Virginia farmer intent on keeping his family out of the Civil War, but with the battles being fought almost literally on his doorstep, struggles to maintain his neutrality. Thursday, May 30, 1 p.m. to 2 p.m.
Manuscript Division historian Barbara Bair will host a webinar highlighting the content and research use of three digitized manuscript collections: the Walt Whitman Collection of miscellaneous manuscripts; the Charles Feinberg collection of Walt Whitman Papers; and the Thomas Harned collection of Walt Whitman Papers. She will also discuss programs celebrating Whitman’s birthday at the Library of Congress. More information is available here. Saturday, June 1, 10 a.m. to 4 p.m.
From 1 p.m. to 4 p.m., visiting families are also invited to participate in the Library’s crowdsourcing initiative “By the People” and help transcribe selections from Whitman’s writings and papers to make them more searchable and accessible online. Monday, June 3, from 2:30 p.m. to 5 p.m.
A reading of Whitman’s poems from his Washington years will follow at the Folger Shakespeare Library that evening. 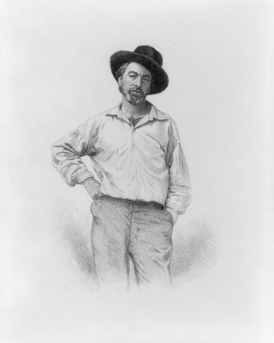 Image: Walt Whitman in his younger years, as shown in this 1854 engraving by Samuel Hollyer used in the 1855 first edition of "Leaves of Grass." Library of Congress Prints and Photographs Division. Smallworks Press, an independent publishing company specializing in limited edition, exquisitely-printed books focusing on contemporary art and culture, has announced it is producing and distributing the highly-anticipated Compass of the Ephemeral: Aerial Photography of Black Rock City through the Lens of Will Roger, the first book of aerial and drone photography by cultural co-founder of Burning Man, Will Roger. Compass of the Ephemeral includes a collection of Will Roger’s photographs chronicling the ever-changing cityscape and transformation of Black Rock City, home to Burning Man and one of the harshest climates in the continental U.S. 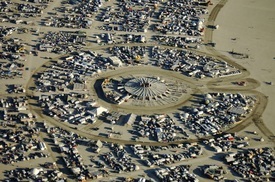 The book traces the history and transition of Black Rock City from a few thousand people in the late 1990s to the growing metropolis required to support over 70,000 citizens today. As the first Director of Operations of the Burning Man event,Will Roger worked alongside the other five founding board members and all others involved to ensure that Black Rock City becomes a reality each year and then vanishes without a trace. He was instrumental in creating numerous foundations for the event, including: established the Department of Public Works (DPW), a workforce of volunteers dedicated to building and deconstructing the physical infrastructure of Black Rock City; actualized an FAA approved airport, and conceived traditions such as the Gold Spike Ceremony, a pre-event commemoration for the builders of Black Rock City, as the first stake is placed in the ground to survey and build the future city. Compass of the Ephemeral also includes interpretive essays by William L. Fox, director of the Nevada Museum of Art’s Center for Art + Environment; Alexei Vranich, American archeologist at the University of California, Berkley; Tony “Coyote” Perez-Banuet, city superintendent of Black Rock City; Crimson Rose, cultural co-founder of Burning Man; and an introduction by Harley K. DuBois, cultural co-founder of Burning Man. Each essay explores the physical, cultural and artistic context and impact of the Burning Man event. A preview of the book will take place at the Nevada Museum of Art on May 23, 2019, from 6:00 p.m. to 8:00 p.m. in Reno, Nevada. Will Roger,William L. Fox and Crimson Rose will discuss aspects of the book with the panel moderated by Smallworks Press publisher, James Stanford. Stanford comments, “I could not be more delighted that Will Roger chose Smallworks Press as his official publisher. Since 2006, Smallworks Press has been producing exceptional visual and interpretive works that reflect the interconnectivity of art and community, a vision that Roger has made tangible each year for the past 14 years, by visually documenting the uniqueness of Burning Man and Black Rock City and by his involvement and contributions to the Burning Man culture and infrastructure.” The book is scheduled for release June 18, 2019. Founded in 2006, Smallworks Press specializes in arts and culture publications and treats each book with a commitment to impeccable production, design and marketing. With more than 100 years of collective experience, the Smallworks Press team has enjoyed collaborating with a wide-spectrum of artists, authors and talent to create works with beautiful chromatic illustrations and stimulating interpretation with the finest print quality. Smallworks Press has international fulfillment through IPG and Gazelle, subsidiaries of Ingram Content Group. Miami Beach, FL — In a focused installation, The Wolfsonian-Florida International University will highlight the transnational legacy of Cuban graphic designer, illustrator, publisher, and caricaturist Conrado Walter Massaguer—a leading voice in shaping early 20th-century Cuban culture who is often credited for bringing modernism to the island nation. Cuban Caricature and Culture: The Art of Massaguer, on view June 8, 2019 through February 2, 2020, presents selections from a new gift of Massaguer material from collector Vicki Gold Levi in addition to loans and other Wolfsonian collection objects. Featuring magazine covers, advertisements, original paintings, rare sketches and personal letters, and caricatures of famous figures from Hollywood stars to royalty and presidents, the nearly 100 works on view call attention to Massaguer’s profound influence on design in both Cuba and the U.S. over his 40-year career. Born in the Cuban city of Cárdenas, Massaguer (1889-1965) was educated in both Cuba and America and frequently traveled back and forth, simultaneously building his reputation as a premier artist and art director in Havana and New York City. Over the course of four decades—and particularly during a brief exile in the U.S. during Gerardo Machado’s dictatorship—Massaguer became a prominent trendsetter in America by designing covers and illustrations for many of the leading magazines of the time, including Vanity Fair, Collier’s, Cosmopolitan, and Literary Digest. While he took many cues from American publications and artists for these commissions, Massaguer put a distinctly Cuban stamp on a 1931 exhibition of his work at Delphic Studios, a New York gallery. There, Massaguer’s impressions of his native country were placed front and center, with a uniquely Cuban flavor evident in the style and themes. Back in his homeland, Massaguer likewise cemented his role in publishing by founding and art directing his own lifestyle magazine, Social, in which he nurtured the careers of numerous Cuban illustrators and caricaturists. 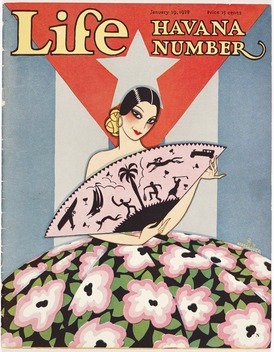 From the 1920s into the 1950s, Social set the tone for Cuban values and taste, heavily publicizing the idea of the liberated and sexualized “new woman” (or flapper) and incorporating a bold Art Deco aesthetic. Massaguer was also central to Cuba’s tourism campaigns, creating striking advertising art that packaged Cuba as a product and sought to lure Americans south through vibrant visions of a tropical playground. His status in Cuban society brought him in close proximity to foreign dignitaries, politicians, and visiting celebrities, many of whom he parodied in his signature, New Yorker-esque caricatures. A Christmas holiday advertisement for Esso made in the aftermath of the Allies’ victory in the Second World War, with caricatures of Joseph Stalin, Winston Churchill, Franklin D. Roosevelt, Charles de Gaulle, Chiang Kai-shek, and Santa Claus. Massaguer’s immense popularity is reflected in a robust market for fakes that Cuban Caricature and Culture will address through a counterfeit illustration of Albert Einstein. By displaying this fraudulent piece beside a genuine version, The Wolfsonian will reveal the forger’s tactics for, and missteps in, mimicking the designer’s trademark flair. The installation coincides with the publication of Promising Paradise: Cuban Allure, American Seduction, a new companion book to a 2016 Wolfsonian exhibition of the same name also drawn from Vicki Gold Levi’s gifts. Touching upon many of Massaguer’s groundbreaking works, the book is the culmination of twenty years of Gold Levi’s interest in Cuban memorabilia and photography, and a capstone to almost two decades of Wolfsonian support and ongoing gifts. WHERE & WHEN: The June 27 event is open to the public, offering all NES members and literary enthusiasts a chance to mingle with winners. This year’s event will be held at New York’s venerable National Arts Club and include a panel discussion with the winning authors, book signings and the awards ceremony. To purchase tickets, visit www.nesnyc.org/upcomingevents or call 212.297.2194.
WHO: Founded in 1805, The New England Society in the City of New York is one of the oldest social, charitable and cultural organizations in the United States. For more than 100 years, prominent writers such as Mark Twain, Ralph Waldo Emerson, Louis Auchincloss, William F. Buckley Jr., David McCullough, Dominick Dunne and Nathaniel Philbrick have been honored by NES. The New England Society Book Awards carry on these literary connections and recognize books of merit that celebrate New England and its culture.